Here is some of the press we have received throughout opening in April 2017! The warm spinach and duck salad at 2145 is a meal in itself. With duck confit, grapes, cashews, roasted beets, goat cheese, and balsamic vinaigrette, it’s an unexpectedly satisfying and hearty mélange ($13). Paired with a glass of wine on the cozy back patio, it’s an experience that’s hard to beat. Costa Mesa. "Orange County’s Best New Restaurants for 2018"
Soulful suckling pig. Finely crafted pizza. Dazzling Peking duck. Orange County is a great place to dine in 2018, thanks to a record number of restaurant openings. The question is, which deserve your attention? Selflessly, we combed through the tangle to narrow your search. Just for fun, we also threw in evidence that the county’s best new spots share serious DNA with some of its best old spots. "Here are the 12 best, unforgettable foods we ate in 2017"
There’s no room for error when making a marinara pizza. The ingredients are few, and if any one of them is flawed, the whole thing fails. To understand what perfection tastes like, take one bite of chef Eduardo Salcedo’s marinara pizza at 2145. The flavor and brightness of the sauce, the garlic, a hint of dried pepper flakes, the thinness of the dough, the heavy char and ashy crust… Masterful simplicity. 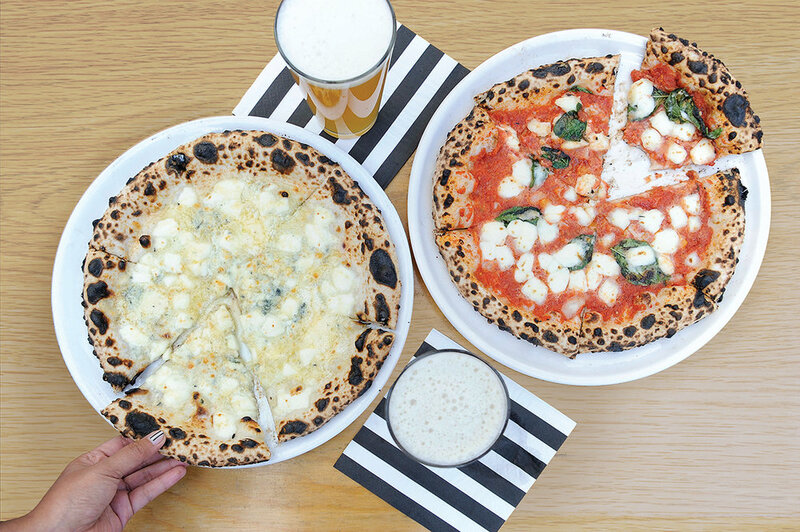 "2145 Pizza, Built Into a Former Auto Garage in Costa Mesa, Mixes Italian + Japanese Food"
The existence of 2145 Pizza couldn't be any more head-scratching if it tried. The restaurant is built into a former car-repair garage and gas station in a nondescript part of Costa Mesa. 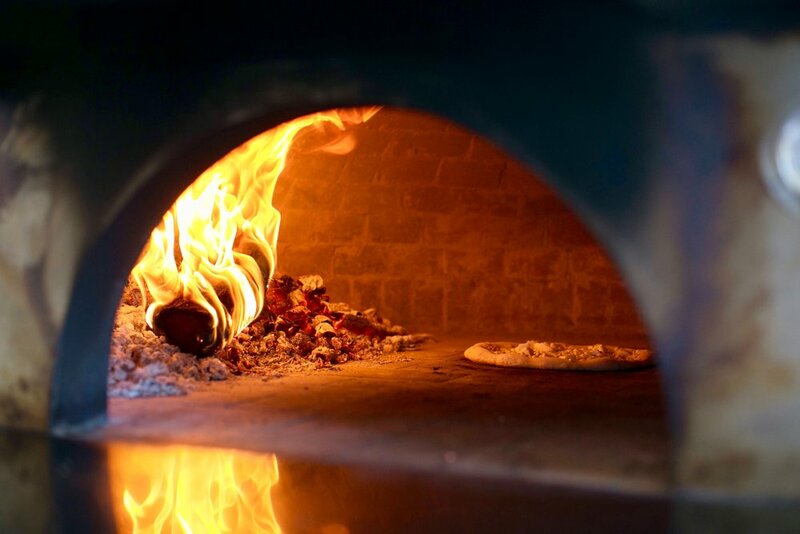 And though the pizzaiolo there bakes pies in the familiar dome of a wood-fueled oven at 800 degrees (as the Naples-style dictates), he uses a sourdough leavened by a 12-year-old starter brought here from Japan. Why? No idea. "These are Orange County’s 10 best new restaurants of 2017"
The coolest restaurant of the year is the one that sprouted from what used to be an auto mechanic’s garage. The garage door, now all glass, is rolled up most days to create a cozy indoor/outdoor ambience with an abundance of natural light. The garage’s old car bay is now the dining room where two large communal tables seat up to 20, plus a 10-seat bar along the wall. Most dining actually happens on the patio. "Sensi Magazine May 2018 - Orange County Pizza Pit Stop"
Still descending from Wagyu dog heaven, I am next to present you with the butternut squash‘s arancini - 2145’s rendition of the traditional Italian rice ball. Made with a panko coating instead of breadcrumbs, the savory snack delivers a satisfying crunch from the first bite. But then the crispy crust is eclipsed by the gooey goodness inside: a creamy mélange of adobo ride, butternut squash, pancetta, and cheese. This plate is accented with a brown butter ricotta purée and paired with an arugula side salad topped with candied pecans, pickled shallots + chilis. "Costa Mesa’s west side comes of age with hot new pizza joint 2145"
Our wine glasses are not yet empty when the waitress arrives with the next round. “You want to chug those?” she asks, smiling, motioning toward our unfinished drinks. The table is already crowded with pizzas and wine glasses, and there’s no room left for anything more. Instead of chugging, I lift my glass off the table to make room for the incoming refill. I’ve ordered more of the same Sangiovese, so I simply pour what’s left of the first into the second.“Oh, I guess that works just as well,” she says.